Note this is a parody. Do NOT take it seriously (just watch, someone will take it seriously.) To see the original Sustainable Development Goals, go to the real UN website. This is a short summary guide to the SDGs as if they were written by POTUS Trump himself. 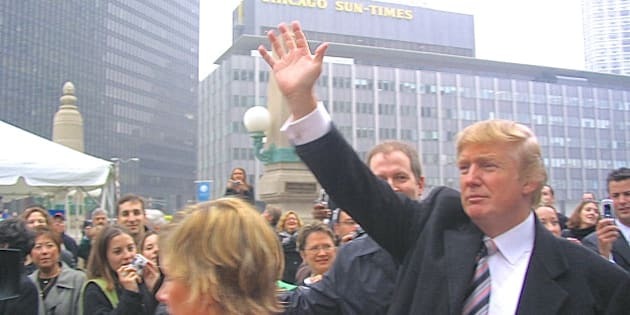 Chicago, IL, USA - October 28, 2004: An overcast afternoon view of real estate developer Donald Trump, from Wacker Drive across the Chicago River toward the old Sun-Times Building, greeting onlookers prior to a public demolition event of that structure, which would make way for construction of the Trump International Hotel and Tower on that site. SDG 1. End poverty in all its forms everywhere. In Trumpese: No one likes poverty. Get rid of it. SDG 2. End hunger, achieve food security and improved nutrition, and promote sustainable agriculture. In Trumpese: No one like hunger. Get rid of it. SDG 3. Ensure healthy lives and promote wellbeing for all at all ages. In Trumpese: Feel terrific and be terrific all the time. Like me. SDG 4. Ensure inclusive and equitable quality education and promote lifelong learning opportunities for all. In Trumpese: Everyone should go to the best private schools, even girls. SDG 5. Achieve gender equality and empower all women and girls. In Trumpese: Treat women and girls like, you know, they are real people. SDG 6. Ensure availability and sustainable management of water and sanitation for all. In Trumpese: Water conservation is simple. Don't let the water run while you are brushing your teeth. Wash your car once a week, max. SDG 7. Ensure access to affordable, reliable, sustainable and modern energy for all. In Trumpese: Small cars can burn biofuels or whatever. Save the petroleum for my limousines and yachts. SDG 8. Promote sustained, inclusive and sustainable economic growth, full and productive employment, and decent work for all. In Trumpese: No hand outs. Make people work hard. Pay them if they deserve it and if they are legally in the country. SDG 9. Build resilient infrastructure, promote inclusive and sustainable industrialization, and foster innovation. In Trumpese: Look at the bridges, highways and stuff -- they are all falling down. Disgraceful! It's time to cut taxes and fix them. SDG 10. Reduce inequality within and among countries. SDG 11. Make cities and human settlements inclusive, safe, resilient and sustainable. In Trumpese: It's true American cities are not safe. Very bad. Do you know what makes cities safe? Big gates and high walls. SDG 12. Ensure sustainable consumption and production patterns. In Trumpese: Make it, sell it and consume it in America. End of story. SDG 13. Take urgent action to combat climate change and its impacts (taking note of agreements made by the UNFCCC forum). In Trumpese: Climate change. Yeah right. Do we really need a 1000 scientists to tell us what the weather will be? SDG 14. Conserve and sustainably use the oceans, seas and marine resources for sustainable development. In Trumpese: Go fishing or a swim in the ocean before the water gets too polluted. SDG 15. Protect, restore and promote sustainable use of terrestrial ecosystems, sustainably manage forests, combat desertification and halt and reverse land degradation, and halt biodiversity loss. In Trumpese: America has the best trees, the best deer, and the best bunnies. No question. SDG 16. Promote peaceful and inclusive societies for sustainable development, provide access to justice for all and build effective, accountable and inclusive institutions at all levels. In Trumpese: Peace, justice, accountability blah blah blah. Hard too have peace when all those bad hombres are sneaking into the country. SDG 17. Strengthen the means of implementation and revitalize the global partnership for sustainable development. In Trumpese: Global partnership for sustainable development? Not a chance! America first!